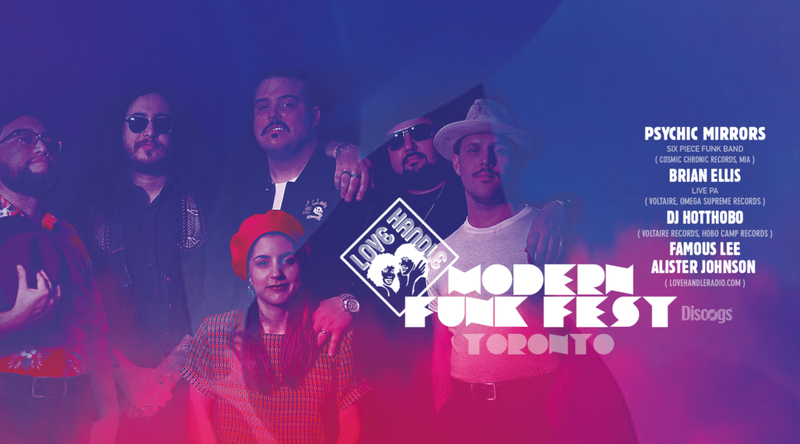 Love Handle, in association with Discogs is proud to present the inaugural Toronto Modern Funk Fest on May 21st inside the Rivoli Backroom. Love Handle is simply the best pure FUNK party in Toronto, holding it down once a month, since ’09, in an all vinyl, respect the dance floor kinda way. Our official anniversary edition in May is gonna be the FUNKIEST and most ambitious jam yet. Straight outta Miami, Psychic Mirrors (Cosmic Chronic Records ) is a six piece Gangsta FUNK band with the chops to hang with the stars of yesteryear, and a sound that keeps the future of Modern Funk directly in the viewfinder. Their debut LP “Nature of Evil” is a mix of boogie funk, yacht rock and wavy synth jazz. Multi-instrumentalist Brian Ellis Hailing from Escondido, CA, Brian Ellis is set on a mission to push authentic drum machine synthesizer funk to the livest, rawest level. His gear list is strong, his output is prolific, and his work ethic is unrivalled! Expect a dance floor ready Live P.A. in true Love Handle style. To top it off what a better way to celebrate an anniversary with one of the best guests that we’ve had in our 7 years of FUNKin’: Randy ‘Hotthobo’ Ellis and his deep crated collection will be the perfect compliment to resident Dj’s Alister Johnson & Famous Lee in keeping the party jumpin til the early morning..
$15 all night! Tickets available at the door.